If you are writing for an audience online, one of the first services you should enable is real-time analytics. You might find yourself adding a snippet of code from Google Analytics (free), Mint ($30), Reinvigorate (beta), Clicky (free), or something else. If you currently use some type of analytics service, which one do you use? Your website analytics data contains valuable information. Most services offer real-time updates so you know exactly where your traffic stands at any given time. Know what content is popular, where visitors are coming from, and where visitors go (Cliff Notes on why you should consider adding analytics to your site if you haven’t already). Armed with your fresh analytics data, you can make informed decisions about content to publish or changes to make on your site. But what about the "real voice" of a users? Page comments are limited to the current page topic and contact forms are private 2-way exchanges between yourself and the sender. Ten people may have taken the time to fill out a form and send feedback, but think about the countless individuals who may have considered sending feedback but stopped because it was just too much work or assumed no one was really listening? One of the greatest aspects about the internet is that everything can be delivered in real-time. If feedback is submitted, users want to know that someone will act on it. For anyone running a website who is open to feedback, it can become challenging very quickly. To control the flow of feedback, here are 5 free or paid services which can aid in collecting feedback and empowering your website(s) visitors. 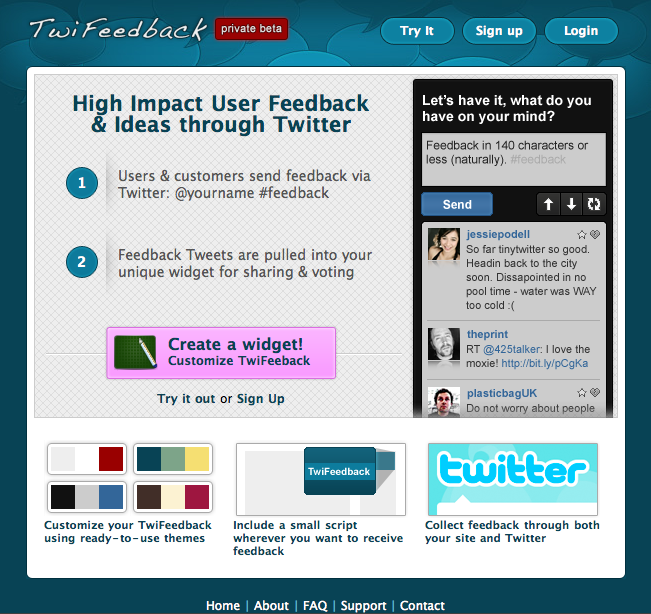 TwiFeedback – Recently announced beta web service which leverages the real-time power and reach of Twitter to collect feedback. Suggestions, questions, support issues, or anything else. A fixed tab triggers a modal Twitter client pulling in existing feedback tweets + the option to tweet your own. Strongly recommend that if you use TwiFeedback, make sure to @reply to users because their unanswered messages will be floating forever in the Twitterverse. 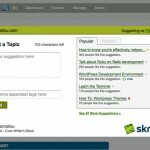 Skribit – Free web service which focuses on the topic of "things to write about". Available as a sidebar widget or modal client. 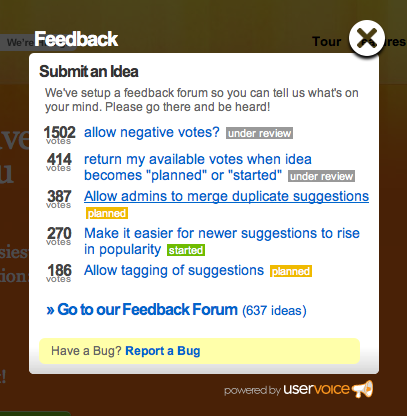 Users suggest topics while other visitors vote in agreement or create their own recommendation. 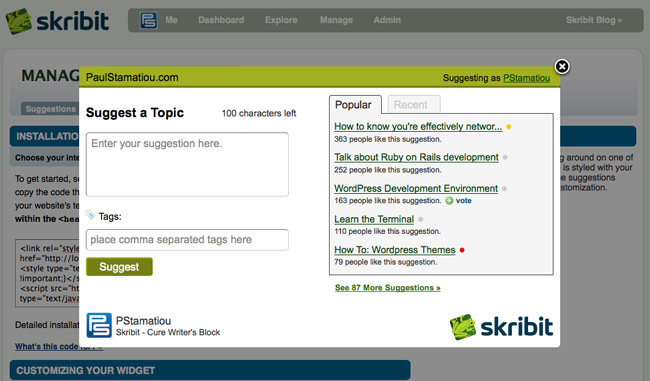 Accompanying web service allows site owners to comment on or reply to individual suggestions. Skribit tallies the total votes submitted giving you a good idea about what topic you should consider writing about next (if you are fresh out of ideas). Get Satisfaction – Primary focus on collecting feedback and providing customer support. Used by both small and large companies to save costs while providing customer feedback which is indexed and made available via search. Individuals who believe they have a genuine support request may log in and search for similar issues before submitting their own ticket. Available as a free service with plans priced out for larger customized deployments. Primary integration options include a modal client or dedicated feedback page. 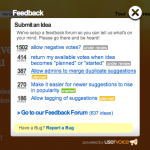 UserVoice – Modal client which collects user suggestions and allows for others to vote suggestions up and add comments. Full integration includes forums, analytics, user moderation, custom domain aliasing, and voting. Available as a free service or via a monthly plan which up the number of votes at a cost starting at $19 / mo. Note that the free plan includes 100 votes / mo. and a discussion forum. Dear site owner, I’m on your site and I have something to say. You implemented TwiFeedback so I know you’re going to receive this #feedback as soon as I send it. Good. Followers of the above individual will see their update and discover the positive or negative feedback. Essentially, anyone on or searching Twitter will know what’s going on and possibly retweet. Good or bad. You as the site owner @reply via Twitter. Answer the feedback or support question. Everyone sees your quick response. Good. You as the site owner fail to @reply. The Twitterverse knows, and you feel ashamed to tweet anything until you respond to the feedback or support question. Bad. 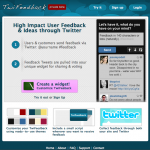 Real-time feedback via Twitter or basic email support. Which one works best for you?